An overview of the Committee’s discussion is contained in the excerpt of the Winnipeg Free Press article below. In the afternoon, councillors on the public works committee went through a lengthy agenda covering the transit, public works and water and waste departments. Some of Winnipeg’s new suburbs could get enhanced transit service next year — if there is money in the budget. The public works committee approved a plan Monday from Winnipeg Transit that would see day-long service to Bridgewater Lakes and Bridgewater Centre; South Pointe; and Sage Creek, Royalwood, Island Lakes and Southland Park. Transit director Dave Wardrop said improving bus service for those neighbourhoods will require buying four new buses, for a total of $2.4 million; and there would be additional annual operating expenses of $348,000; and it would necessitate the hiring of 11.25 full-time equivalent bus drivers and maintenance staff. 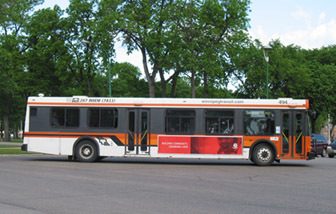 Wardrop said Winnipeg Transit’s plan is to implement the improved service for September 2016 but only if the project is funded in the 2016 budget. The plan has the support of public works chairwoman Coun. Janice Lukes, who said she’ll be advocating for additional funds for transit in the 2016 budget. Councillors will have to wait a few more weeks for a series of reports reviewing several public works operations. The reports, including snowclearing and a potential province-city procurement plan for road repairs, were due at Monday’s public works meeting. However, acting director Lester Deane said his staff needed more time to finalize the studies. Deane said he believed the reports will be ready for the committee’s November meeting.